Khaki or blue denim pants, shorts, skirts, jumpers and dresses. Solid colors only with no writing or holes. Navy, white or gray collared shirts (solid colors only). 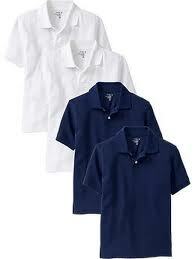 Oak Springs Elementary school shirts in any color are also appropriate for standardized dress codes. No logos, pictures or writing on any clothing, except school shirts. No tank tops, tube tops, spaghetti straps, undershirts, beachwear, or visible underwear. Closed toe shoes or tennis shoes (white shoes with white laces or black shoes with black laces). No flip flops, sandals, or "Heelies." Remember that K-5 scholars have PE or recess and they must be in the appropriate attire. Sweaters, coats and jackets are allowed so long as they are free of any logos, pictures, or writing that pose a threat to their learning environment, express messages that are vulgar, obscene, lewd, sexually explicit, or plainly offensive, or express messages that advocate illegal drugs, tobacco, and alcohol use or encourage violations of school policy. "Wrong sized clothes," either too big or too small, may not be worn at school. Skirts, dresses and shorts must be at least fingertip length. Shirts meant to be tucked must be tucked. Shirts not meant to be tucked must not exceed wrist length. Pants must fit around the waist or a belt must be worn. Oversized sagging pants will not be tolerated. 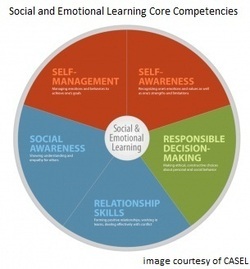 Social and Emotional Learning (SEL) is the capacity to recognize and manage emotions, solve problems effectively and establish positive relationships with others. SEL provides direct instruction and skills that enable students to succeed in college, career and life by being responsible citizens and decision makers. Instruction in SEL enables students to see themselves and others in a positive light, manage emotions, set and achieve goals and solve problems they encounter effectively. It supports school cultures and climates to allow students to practice life skills throughout their school experience. AISD is part of the Collaborative for Academic, Social, and Emotional Learning (CASEL), which works to create a district wide model for SEL in an urban setting, based on the tenets of self awareness, self management, social awareness, relationship skills and responsible decision making.